Image Formats - raw vs. QCOW2. As previously mentioned, Glance supports a variety of image formats; however raw and QCOW2 are the most common. While QCOW2 does provide some benefits (supports copy-on-write, snapshots, dynamic expansion) over the raw format, it should be noted that when images are copied into Cinder volumes, they are converted into the raw format once stored on a NetApp backend. Use of the QCOW2 image format is recommended for ephemeral disks due to its inherent benefits when taking instance snapshots. Use of the raw image format can be advantageous when Cinder volumes are used as persistent boot disks as a conversion from an alternate format to raw that would be performed by Cinder can be avoided. Both raw and QCOW2 formats respond well to NetApp deduplication technology which is often utilized with Glance deployments. NFS with Deduplication. Since there is a high probability of duplicate blocks in a repository of virtual machine images, NetApp highly recommends to enable deduplication on the FlexVol volume(s) where the images are stored. You can check the status of deduplication for a particular FlexVol volume by issuing the volume efficiency show command as seen below. Efficiency for volume "vol2" of Vserver "demo-vserver" is enabled. NetApp contributed a capability to enhance instance creation which focuses on booting tenant-requested VM instances by OpenStack Compute Service (Nova) using persistent disk images in the shortest possible time and in the most storage capacity efficient manner possible. This Enhanced Persistent Instance Creation feature (sometimes referred to as Rapid Cloning) is achieved by leveraging NetApp FlexClone technology, as well as the NetApp Copy Offload tool. The Enhanced Instance Creation feature can significantly decrease the time elapsed when the Nova service is fulfilling image provisioning and boot requests. The NetApp Copy Offload tool was added in the Icehouse release to enable Glance images to be efficiently copied to a destination Cinder volume. When the Cinder and Glance are configured to use the NetApp NFS Copy Offload tool, a controller-side copy is attempted before reverting to downloading the image from Glance. This improves image provisioning times while reducing the consumption of bandwidth and CPU cycles on the host(s) running Glance and Cinder. This is due to the copy operation being performed completely within the storage cluster. The storage system must have Data ONTAP v8.2 or greater installed. To configure the copy offload workflow, enable NFS and export it from the SVM. The vStorage feature must be enabled on each storage virtual machine (SVM, also known as a Vserver) that is permitted to interact with the copy offload client. To set this feature, you can use the nfs modify -vserver openstack_vs1 -vstorage enabled –v4.0 enabled CLI command. Figure 5.1, “Enhanced Instance Creation Flowchart” describes the workflow associated with the Enhanced Instance Cloning capability of the NetApp driver. In the second decision point in the flowchart described in Figure 5.1, “Enhanced Instance Creation Flowchart”, Cinder determines if the source image from Glance and the destination volume would reside in the same FlexVol volume. This can be achieved by creating a directory structure within the NFS export to segment the Glance images from Cinder volumes, and appropriately setting the filesystem_datastore_dir and nfs_shares_config. This configuration could also be used in conjunction with a single NetApp InfiniVol volume. In order to take advantage of the Enhanced Instance Creation feature, there are several configuration options that must be appropriately set in both Cinder and Glance. Set the default_store configuration option to file. Set the filesystem_store_datadir configuration option in the [glance_store] stanza to the path to the NFS export from the desired FlexVol volume. 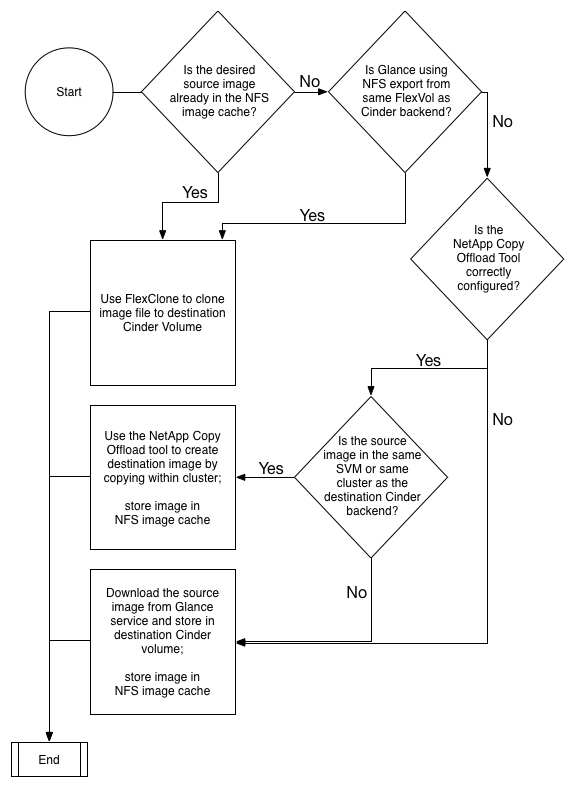 Set the filesystem_store_file_perm configuration option in the [glance_store] stanza to be the file permissions to be assigned to new Glance images; alternatively, make sure that the effective user of the cinder-volume process has access to read Glance images from the NFS export (e.g. add the cinder user into the glance group). Set the show_image_direct_url configuration option to True in the [default] stanza. Set the show_multiple_locations configuration option to True in the [default] stanza. Set the netapp_copyoffload_tool_path configuration option in Cinder (under the appropriate backend stanza) to the path to the NetApp Copy Offload binary as installed on the system running cinder-volume. Set the glance_api_version configuration option to 2. Leveraging the “boot from image (creates a new volume)” option in Nova, you can leverage the enhanced instance creation capabilities described previously. Normally volumes created as a result of this option are persistent beyond the life of the instance. However, you can select the “delete on terminate” option in combination with the “boot from image (creates a new volume)” option to create an ephemeral volume while still leveraging the enhanced instance creation capabilities described previously. This can provide a significantly faster provisioning and boot sequence than the normal way that ephemeral disks are provisioned, where a copy of the disk image is made from Glance to local storage on the hypervisor node where the instance resides. There are three tunable parameters within the Cinder driver configuration that can affect the behavior of how often space utilized by the NFS image cache managed by the NetApp unified driver is reclaimed for other uses: namely, thres_avl_size_perc_start, thres_avl_size_perc_stop, and expiry_thres_minutes. For more information on these parameters, refer to Table 4.10, “Configuration options for clustered Data ONTAP with NFS”.